Every year, we pack up the kids and meet my mother in law, sister in law and her family at a little bed and breakfast/ farm in Southeast Missouri. The farm is owned by a friend of the family who rents out the two houses and small rustic cabin to friends for weekend vacations throughout the year. 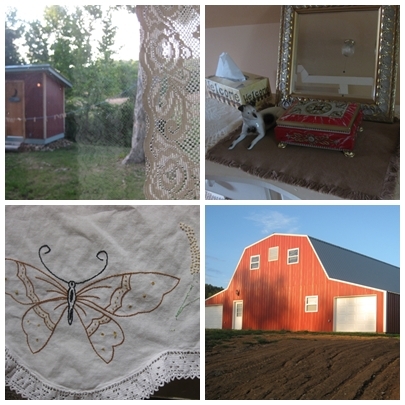 The farm has a beautiful spring fed creek, newly built barn for weddings and events. They provide hayride tours of the property, outdoor fires for making s'mores and a fully furnished country home for relaxing. There are trails to walk, wildlife to see and the nearest town is miles away. We always stay at the farm house by the creek, which is over 100 years old. It has a tin roof, porch swings, adorable country kitchen and cozy attic bedrooms. It was a beautiful weekend. It rained on Saturday morning so we sat on the porch watching the kids splash in the rain while we listened to the "tink tink tink" of rain on the tin roof. I knitted while my sister in law crochted. After the rain, we splashed around in the creek for a while. Pj caught a wild (non poisonous of course) snake. Look at that! He plucked it right out of the water! Knitting and relaxing-that sounds like my kind of vacation! I think the hubby and I have decided that next year's vacation is going to be something more like this! What a great way to spend family time, sounds so nice, except for the snake!!! I am afraid of all snakes, even non poisonous. Wish I could get over that. Enjoy, you have a wonderful family. What a lovely place for a trip. That place reminds me so much of my hometown in Virginia. I can't imagine how relaxing it was to knit with the rain hitting the tin roof. Love the yellow knitting day sandals. In the words of Liz Lemon: I want to go to there! That picture of PJ with be so small if I took it. I'm am deathly afraid of snakes, as soon as that baby was out I would have been running like a race horse in the other direction! What a sweet place! You look just perfect next to the cabin in the first photo! That sounds amazing to me right now. I'm feeling the need to just get away. Beautiful pictures! That sounds wonderful! Especially the rain. I'm glad you had such a nice time. We need to make time for a vaca there!! Looks like a very nice place to unwind for a bit. You remind me of pictures of my granny in the late 40's with that dress on and she loved her porch swing. Glad you are back posting. oh it looks totally wonderful, if I ever come to America this is the kind of place I want to be! Without the snake maybe!! Such a relaxing, wonderful getaway spot. I love little, rustic corners of the world like this and would greatly enjoy spending a few days there, too. Adore the punchy yellow shoes you were sporting while knitting on the porch.